The Dusk® Detangler The Dusk® Detangling brush is the ultimate hair brush for smoothing out tangled hair. Improve hair quality, stimulate hair growth and save time and money, with fewer trips to the hairdressers. Conventional hair brushes damage hair, causing split ends that mean you have to go to the salon more often. With the 247 precision length, flexible bristles of the DUSK detangler, this is no longer the case. Our brush actually improves hair quality and stimulates hair growth. It’s time to throw away your old fashioned bobble bristle brush and embrace the future of easy knot free bliss. The end of tears and tantrums, pain-free brushing to make detangling your kids hair easier! We all know the hassle of trying to de-knot the kids hair just before school or at bath time. It’s just another thing to juggle in your already hectic life! With the DUSK detangler you can skip the screaming fits and teary tantrums with pain free brushing! Not only can you use it on wet and dry hair, it works on all hair types. 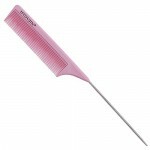 This brush will also help detangle wigs, extensions and weaves too! The perfect detangling companion for any hair type. Unique Handle Design Gives You More Control! Getting rid of those nasty tangles smoothly is all down to the brush you use. With the Dusk® Detangler It’s easier to control the amount of pressure you need to use when brushing. This helps remove tangles and knots quickly, so you can say goodbye to going through the same areas over and over. We have been bombarded with feedback from customers saying that the handle on our brushes provides a welcome upgrade from previous detanglers that they have used! Click ‘Add to Basket’ now to take control of your tangled hair! DETANGLE YOUR HAIR IN SECONDS WITH THE DUSK DETANGLING BRUSH! 274 innovative, high quality, flexible bristles that will gently glide through knots with minimal friction. Spend less time brushing and more time showing off your silky smooth hair! KIND TO HAIR TECHNOLOGY! Fed up with conventional brushes breaking your hair when running through knots, causing split ends and an overall tatty look? The flexible bristles of the DUSK detangling brush are scientifically proven to do the opposite and actually stimulate hair growth. THE HAIR BRUSH EVERY GIRL NEEDS! Ideal for hairstylists, home use and the best detangling brush for kids – no more tears and tantrums. WORKS ON ALL HAIR TYPES! Whether you have fine, thick, curly, straight, wet or dry hair you’ll be pleasantly surprised at how effortless our hair brush is. You’ll wonder how you ever survived without it! AT DUSK WE STAND BY OUR NO QUIBBLE LIFETIME GUARANTEE! In a new world of throw away culture, our products are built to last! If you have any issues with our detangler brush well send you a brand new one!